Clare Ashton writes books that you love to read. They are complex, fun and capture your attention the whole way through. She builds characters and relationships with such skill you cannot help but be swept off your feet. 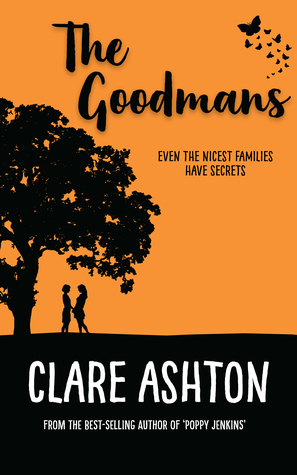 The Goodman family is messy and downright loveable. They are all charismatic individuals who love each other fiercely and also step into mess after mess. The majority of the times, we, the readers are seeing life from the perspective of Maggie, Jude, and Abby. These characters are quirky, infuriating, and irresistible. Maggie, Jude’s mother made me want to scream one minute and hug her very next. Abby and Jude are both doctors. They met as teenagers at university and became fast friends. When Abby was just nineteen and away at school her mother was struck by a drunk driver and killed. That tragedy solidified Abby and June’s friendship. Jude and her family became touchstones for Abby and she has incorporated them into her life ever since that fateful day. Abby loves Jude, as a best friend sure, but so much more than that. Her feelings run so much deeper, and she knows nothing can come of it. Jude has always dated me and has never given her an inclination of being anything but straight. When Jude’s boyfriend, suddenly proposes, the walls Abby has erected come tumbling down. No matter how hard she tries Abby cannot hide her heartbreak. This story is about best friends seeing each other in a new light, Jude sees Abby in a way she has never looked before. She opens her mind to being with Abby in a new and suddenly very attractive way. What it also is confronting the past and being open to a new future. For a long part of the story, I kept wondering why we had Maggie’s perspective. It all makes sense when an old friend comes into town. This book is fun, dynamic and keeps you hooked. Clair Ashton does not disappoint. This book is one I cannot recommend enough.